It is a “must read” for serious students and practitioners of leadership. If you want the insights, leadership tools – and inspiration – to create a noble enterprise and lead your people to new heights of performance, then this is the book for you. We live in an era when people seek more meaning in their work, companies seek more effective ways to create sustainable growth and profitability, and society wonders if business will be about greed and unethical practices, or will play a positive role in society. Meanwhile CEOs face the challenge of serving multiple stakeholders and the need to improve business performance – faster than ever. To respond to these challenges and to succeed in today’s business world, leaders need to create noble enterprises that draw forth and utilize the full range of human energies. Noble Enterprise shows how. Noble Enterprise features the inspiring story of how one near-death company (losing one million dollars a day!) used the principles of Noble Enterprise to turn their company into an industry leader, in the process achieving huge leaps in employee morale, quality and market growth and profitability – all in just three years. 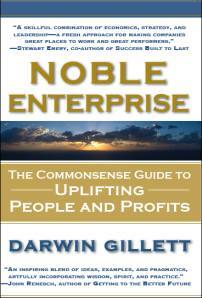 Noble Enterprise guides and inspires business owners and executives to lead their people in creating business performance far beyond the norm, in the process awakening and activating the rich array of human energy, wisdom, passion and purpose for personal growth, for business growth and prosperity, and for enhancing society’s development. Give you the insights, leadership tools – and confidence – to lead people to new heights of performance. Learn how to leapfrog the competition by creating competitive advantage based on who your people are (their character), not just on what they know (their expertise) and what they do (their actions). * Cosimo offers discounts on orders for multiple copies.